Some cats act normal, other cats act weird. Of course, cats may be considered weird period, but some behavior is just…off. If you as an owner see erratic cat behavior, you may be unsure of how to act. But what qualifies as erratic cat behavior? Well, read on to find out. Here, we will discuss what is erratic cat behavior, and what it means if you see any of this within a kitty. The most common signs of change that you can look at in a cat, is eating. Some cats eat normally, some cats eat weird stuff, which we will get to in just a second, but not eating period is a cause of alarm. It’s actually a bigger thing than you might believe because the health of a cat is negatively affected by this. If they don’t get the right nutrition, this can cause the cat to lose control of their health. It causes different problems, including a huge amount of weight loss, and it can be devastating for already small cats, to begin with. If you see this in a cat, it’s important to get their butts to a vet quickly, since it could be a huge problem with a cat, and it’s an erratic cat behavior that you should watch out for. 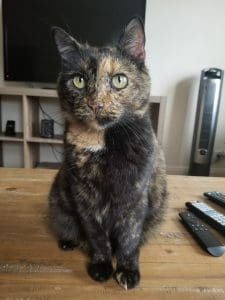 This is often called pica, and while you may have heard of pica in humans, such as randomly eating dirt and clay, it’s actually much more worrisome in cats. Eating random stuff is sometimes done out of boredom, but it can be a sign of underlying issues, and if this gets into a cat’s system, it can actually be devastating and create alarm, since it does require surgery. Usually, the best thing to do is to see a vet if you’re worried about a cat’s behavior. Sometimes, a cat does this out of boredom, but if they’re obsessive over it, that can be a problem. Some cats do this because they’re stressed, or bored, and there may be changes in the surroundings that cause this. This is an abnormal cat behavior, and you should make sure that if you see this, you talk to the vet. Usually, if they’re weaned too early, they do this, and it’s common that it happens in indoor cats. These can lead to other excessive behaviors, so always make sure that if you need to, you see the vet whenever possible. Cats do need water, just like how we do, but if you see your cat just drinking and drinking water excessively, with no actual spillage happening, you should see the vet right away. While cats need water like the rest of us, it can actually be a huge problem. If a cat is just guzzling down water in a way that’s abnormal, not because it’s super hot, that should be cause for concern. But, on the other side of the spectrum, if a cat isn’t drinking water period, that’s cause for alarm. If you notice that, you should take your cat to the vet as well. Some cats groom a lot. Some groom a little bit, some don’t groom at all. here’s the thing though, a change in it is something that can be of concern. In some cases, it could be because your cat is fat, and they can’t access the back of their fur. But, there are actually some major reasons as to why a cat may not be grooming themselves, grooming weirdly, or too much. Cats groom themselves as a means to actually take care of their coats. It’s how they bathe, and if they’re not doing it enough, or at all, that’s a sign of the problem. Remember, you as a caretaker are responsible for their coats of hair too, so always make sure that you realize this when you’re taking care of the furry little friend. Sometimes though, if the cat has some aggression and they don’t have a hunting outlet, this can happen. That’s why sometimes cats get a little bit much when you play with them, but if they’re being really mean, that’s a cause for concern. With a cat, this actually means something. Your cat is trying to tell you what’s going on. Pain is a major cause for this, and your cat may just be mean because they want to tell you that they’re suffering and need your help. Fear of something is another reason why they may get mean. If they have to visit a vet or a boarding facility, have new animals in the place, going outside for the first time, being around new people that they don’t like, or even smells that they don’t like can actually cause a cat to lash out. Pain from surgery and trauma including accidents and such, or even declawing and amputation can cause this problem. 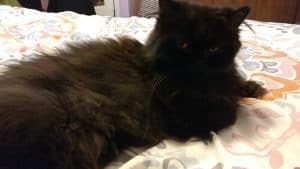 The best way to resolve this, is to eliminate the reason why you’ve got the pain and fear happening, using the various medications and supplements that they need, and also reassuring your cat that you’re here. You should definitely see your vet if you notice some excess aggression because chances are, they’re trying to tell you something is wrong. Some cats like to hide, but there is usually a reason behind it. If a cat is a bit spooked by the vacuum cleaner, they may have other issues if they’re hiding a lot. If a cat isn’t feeling well or scared, they can sometimes go off. Unfortunately, some cats may end up leaving if they know that the end of their life is close. The reason why a cat hides is actually always there. Cats normally either want space, but if they’re ultimately hiding, chances are, there is stress or trauma there. Cats do have fears just like we do. If it is a recent event, chances are they should be back to normal after a couple of days. If it’s an illness or something, it might need to be checked out by a vet, because it could be signs of something bigger. Cats get anxiety like the rest of us, and that’s actually how they start to develop fears and behavior that isn’t normal. Fear is a feeling of apprehension, and while it is normal to respond to the scary things in this way, some cats develop an excessive amount of it. Anxiety is sometimes known as “future danger anticipation” so they may develop these fears whenever they see something because of future events. Phobias are more in the extreme sense, and they are fear reactions that are harder for them to treat, such as noises or places. By examining the cat with a vet, you can find out why they are acting this way. Many of the behaviors they adopt are slow, and it involves low-level exposure of the fear to improve it so that they get desensitized. It’s used in the same vein as fear handling tactics are used in humans, and you can work on modifying the behavior easily. If you treat with medications, you sometimes will need to watch this for side effects, and it’s not advised to just use that, because the stimulus producing fear isn’t tackled. While some cats tend to be more playful than others, just like how some humans tend to be more social and prefer the stimulation compared to others, if you notice that a cat who plays a ton with you just suddenly stops, that’s cause for concern. That’s because it might be because they don’t feel good, or something is wrong. Perhaps playing is what’s causing them pain. If you notice this abnormal behavior, take them to a vet, since it is an erratic cat behavior that may seem small, but it can lead to problems. Again though, some cats are more playful than others, and if they’re still playing a lot, instead of just shying away from playing, then you should be fine. But, if you feel like something is off, you should definitely take the cat in. This is a behavior change in urination and defecation, and usually, the reason why this happens is stress, fear, and litter box problems. The first thing that you should always do if you suspect there are medical problems is obviously going see a vet. If you notice that your cat is fine, they’re just communicating box issues, you should focus on fixing the environmental issues. Some cats are little buttheads about their litterbox being taken care of. Sometimes, they may be too big for the box. One of my cats had issues with the box because he’s too chunky for it, so I needed to get another one for him. You should focus on making sure that the cat is taken care of as well. The cat is straining, crying, or eliminating out of where the litter box is. As of note, if you notice that the male cat is unable to urinate, it does become life-threatening in short order if you’re not careful. Another strange vocalizing that owners may notice is they will vomit a hairball, but right before they will vocalize it. Sometimes that’s your cat’s way of telling you, but otherwise you should be careful and watch for these behaviors. If you notice any of these behaviors, you should schedule a visit to the vet for a good diagnosis. It’s a very small change, but it’s a change that some don’t even realize is a thing. Cat scratching is usually a normal thing, and that’s why you get scratching posts for your little guy. But, what if you notice that they’re scratching more. If you notice this, chances are they are a bit stressed. Usually, this is a sign of anxiety or stress. In that case, you should get them some supplements that are used to relax the cat, but without sedation. Another good thing to get them is some pheromones since it does lower the stress level. If there are reasons for them acting this way, you should definitely start to cater to these changes in the environment, since correcting this is the way to go. Did you know that scratching is a form of marking their scent on there? For some cats, they naturally do it. When they scratch, they’re marking themselves on there, but if a cat is stressed out, chances are they may do it more, and it can be a huge problem if left unchecked. You should as a pet owner watch for these sleeping patterns, and make sure that your kitty isn’t in pain or danger. Really, if you notice anything out of the ordinary, you should always take them to the vet. As an owner, it’s important that you make sure that you take the time to really make sure that your cat is healthy and taken care of. These are the key erratic cat behavior changes you may see, but if you notice period that your cat is acting funny, you can always take them in. plus, as an owner, you should try to get them in once a year for a checkup. This is important not just for the health of the cat, but also to make sure that your cat is happy and healthy, and you as an owner can make sure that your cats are taken care of, and seeing the vet before it gets too bad off will prevent the erratic cat behavior from happening. PreviousPrevious post:Cat Night CraziesNextNext post:Should I Feed My Cat More Than Once a Day?